One thing we'll do a lot of on ROADTRIP-'62 ™ is to drive through small towns. In fact, we'll drive through many more small towns than big cities. We start in the small town of Mackinaw City, Michigan and for almost the first 200 miles of the journey, all the cities are smaller than 50,000 people. Then, southern Michigan has big cities spaced about every 20-40 miles apart until we reach Toledo, Ohio. From there, we cross Ohio with only the metropolis of Columbus as an island in the rural landscape. Through Kentucky and Virginia, only the Ashland, Kentucky area might peek above 50,000, but only if you count the entire area around the city. We finally reach another pair of big cities at Kingsport and Johnson City, Tennessee, over half way through our trip! From there, we pass through empty mountain scenery except for Asheville, North Carolina, until we reach the biggest city on US-23, Atlanta, Georgia. After that, there is only one more big city, Macon, Georgia, before the end of the route. At the end, Jacksonville, Florida is a huge city, everything that the beginning of our trip was not. So, besides the population, just what are some of the defining characteristics of small towns? Or better still for our purposes, what were some of the defining characteristics in 1962? I've been given some wonderful information and photos by Cheryl Hill Canty of the Fenton Historical Society. Because of this information, and the fact that I've been to Fenton many times, I'm going to use it as an example of small towns and base much of this discussion on it. But I'll also look at cities all up and down US-23 as appropriate. Why did a small town stay small, when sometimes a bigger city is only 20 miles away? Usually, it appears that the small town location had no great advantage when founded. Perhaps it had less accessible natural resources than the next place, or perhaps it was just slightly off the main transportation route. Sometimes it was because the founder, local entrepreneur or booster didn't have sufficient capital or skill to build a big business, the needed infrastructure, to advertise the location to prospects, or to weather a financial depression. Maybe it was founded just a little too late and couldn't play catch up with a nearby city. Sometimes a mining town shrunk when a mine closed. In a few cases, maybe the town once had an advantage such as being the local county seat of government, but then the government moved to another town. That's what happened to Omer, Michigan, the smallest city in Michigan, which we saw earlier! Fenton was one of hundreds of farming towns along US-23, in southern Michigan, throughout Ohio, and in southern Georgia. Fenton had a grain mill and grain elevator, as did many villages in farm country and appears to have always been a commercial center for the surrounding agricultural area. But it was not a county seat, so it was not the destination for government needs of area farmers. It was not a railroad town, as no junction or large yard was located in Fenton. The junction was five miles southeast in Holly, Michigan. Some big cities like Columbus, Ohio had state-funded universities, but some small towns on our route, such as Pikeville, Kentucky and Gainesville, Georgia, had only private colleges that never attracted much population. Fenton was not a lumbering or mining town and never went through the bust phase of community life that characterizes those towns. But it did have a couple of large industries during its growth phase. These were large enough to keep it growing into the early 20th century. This is a pattern we will see repeated up and down US-23 in small towns. An area will create a couple of industries by growing local small businesses. It only takes one or two good entrepreneurs to get that started. During their lifetime, these businesses can grow to supply national markets. For Fenton, one of its large industries was cement processing, based on the clays at the bottom of local lakes. This was dredged, dried and further processed, and combined with other materials to make cement. The other large industry, A.J. Phillips, made a variety of wood products including screen doors. The screens were sold nationwide and even bought by the White House at one time. These industries both grew and helped the town to grow until the early 1900s. After the original factory owner died, the plant continued for a few years, was converted into an automobile factory, but burned down around 1909. The cement plants discontinued operations by the 1930s, likely because the clays became expensive to extract as the lakes were continually deepened, or were exhausted, or they were just another business casualty of the Great Depression. After that, some machine shops prospered here, supplying automobile companies as many did all over Michigan, but no new large industries have replaced those early ones. Fenton then grew gradually, meeting the local needs and reaching a population of about 6100 by 1960...until the freeway came by. A measure of just how close Flint became in the 1950s, when travel by car blossomed all across the country, is that the US-23 Highway Theatre we stopped at last night, built to serve the Flint market in 1952, is only 10 miles north of downtown Fenton. The freeway came south from Flint in 1958, taking US-23 out of downtown. In 1964, the Village of Fenton re-incorporated itself as a city and was already reacting to suburban pressures from its larger neighbor. 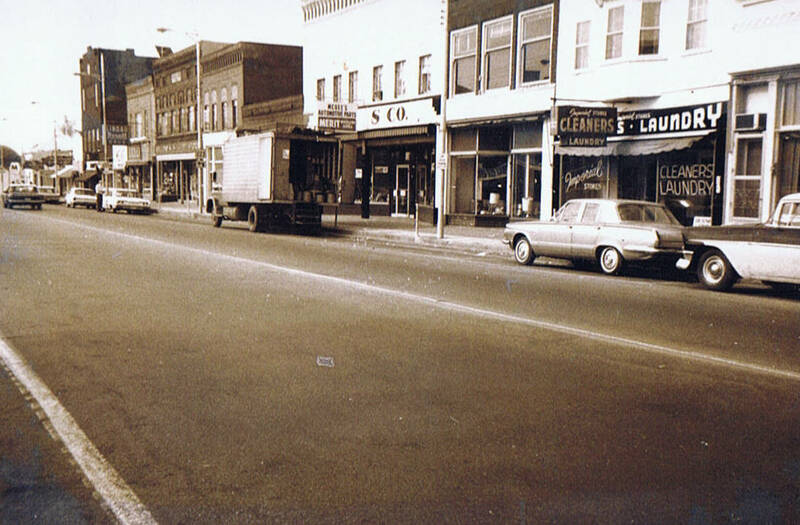 At this time, photos still show a typical small town, with brick commercial buildings downtown. You could find everything you needed downtown in the early 1960s: a drug store, hotel, hardware, post office, restaurants, lumber yard, churches, supermarket, clothing stores, and more. One prominent feature of older downtowns was the dime store, 1962's equivalent of today's dollar store. In 1962 we could have visited the D&C Store in Fenton, to pick up some supplies on our trip. Maybe we would grab a new coloring book to keep the kids busy while driving, maybe we ran out of OFF!, needed more film for our camera (no digital cameras then), or wanted to buy a postcard to send grandma: the dime store is where we would have found all that. Today, we're accustomed to finding these things out on the fringe of a city, on a wide, fast, and congested highway. Fenton today is no different, with a strip of typical big box stores and fast food reaching out to the freeway interchanges and north towards Flint. The downtown today houses some very nice specialty shops in the remaining lovely old brick buildings, but for everyday needs you shop near the freeway. We'll see this same pattern in many of the small towns we pass through: specialty boutique and tourist shops in old downtowns. What happens to the downtowns when the local folks no longer shop for everyday necessities? Some downtowns end up mostly empty buildings and we'll see those in the coal mining areas of Kentucky. Some successfully change to tourist attractions and we'll see some of those, such as Waynesville, North Carolina. Fenton is a unique combination of these types. In the late 1960s the City Council decided to use Federal Urban Renewal funds to tear down three entire blocks of old buildings downtown. One of the buildings was saved in 1975 and actually moved to a new location, clear across the county! The former D&C Store was dismantled brick-by-brick and reconstructed in the historic Crossroads Village near Mt. Morris, which we passed through yesterday. As you can see from the photos above, when they rebuilt it, they reversed the buildings so that the 2-story portion now sits to the right of the 3-story portion! Urban Renewal programs are something usually associated with bigger cities, but they have the same results no matter the size of the city. Without the density of development of the old downtowns, the number and variety of businesses decreased and many businesses closed or moved. Modern commercial buildings have slowly filled in the empty spaces, including a new post office and a new bank in a faux old style as shown here. This same pattern of destroying the downtown was repeated all over the country: another example is Mansfield, Pennsylvania, on our US-6 journey. Something that almost all small towns needed even before the automobile was a hotel. Now they only have motels at the freeway interchanges, and usually only in resort areas. But once, even a town of just a few thousand people would have visitors, coming to businesses or to government buildings. If a town was a bit larger and had a college or hospital, they might need a couple of hotels. And if it had any type of resort nearby or was on a main travel route, that meant more travelers. Fenton attracted its share of travelers and had a couple of hotels, one of which is still standing, though not renting rooms. The Fenton Hotel Tavern & Grille is open as an upscale restaurant so you can still stop in and see the beautiful bar. That's also something hotels and restaurants in small towns have turned to increasingly, recreating themselves as upscale destination restaurants open only for the dinner and evening crowd, to attract people from nearby towns. We'll see it several more times during our trip, in places like Norton, Virginia. In 1962, we would have seen the hotel when it was called the Hotel Fenton, where the owners, the O'Reilly's from 1946 until the early 1970s, had a reputation for "Roadhouse" dinners. Comparing the photos below, the name has changed from the DeNio House, the porches, awnings and marching band are gone, but the underlying building remains the same. It holds the distinction of being the longest running continual establishment in Michigan and you can still enjoy dinner there. Despite being small, many towns have at least one notable example of architecture by a well-known architect. Sometimes, there may have been one individual rich enough to pay for expert design and desirous of leaving something to the community. Some small town libraries were created in this way. Sometimes a railroad company thought the town needed an elegant station for a projected increase in traffic. Sometimes the citizens taxed themselves to create a grand city hall or county courthouse. Some great church architecture occurred in a similar manner. Fenton has a Community Center built in 1938 and designed by renowned international architect Eliel Saarinen. Saarinen came to the United States from Finland in 1923, after he had entered a competition for design of the Tribune Tower in Chicago, Illinois. He later became a professor in the University of Michigan's Architecture Department, living in Bloomfield Hills, Michigan. He designed many of the buildings at the Cranbrook Educational Community in Bloomfield Hills. The Community Center exists largely through the efforts of the trustees of the estate of Horace H. Rackham, whose family lived in Fenton. The estate also funded the Horace H. Rackham School of Graduate Studies of the nearby University of Michigan, and this linkage is how Mr. Saarinen's work came to be in this small town. I've mentioned how the opening of the freeway helped change Fenton, and freeways changed every small town they passed by. Sometimes the freeway brought a small place closer to a big city, and changed it into a suburb. Sometimes the freeway bypassed the small town and took traffic out of it. Douglas Heinlen of the Historical Preservation Society of Dundee related to me how the opening of the US-23 freeway around Dundee, Michigan changed that town. When US-23 used to go through downtown, sports fans from both Ohio State University and the University of Michigan would stop in on their way to and from games. US-23 connects both those universities and they are only about 180 miles apart, so they get fan traffic between them when the teams play each other. One place the fans used to stop was the Coffee Cup Restaurant, where on game-day Saturdays people would be lined up to eat. After the freeway, you could make the trip faster and without a need to stop, so business slowed down. The Coffee Cup burned down around 1982, so we can't make a stop there when we drive by Dundee. But the opening of a new freeway gave a small town a short term boost with the actual event of its opening! The ribbon cutting ceremony on US-23 at Dundee in November, 1959 shows both local and state dignitaries. A Dundee homecoming queen, Barb Kahley, cuts the ribbon while State Highway Commissioner John Mackie watches on her left. Quite a festival was made of the event, with local kids racing on the new US-23 in what were known at that time as "track rabbits" (a type of go-cart). Quite a few towns gave such a big welcome to the freeway, not knowing it would eventually help dry up business on their main streets. The opening of a freeway was a big event just down the road in late 1962, in Sylvania, Ohio. Clippings from The Sylvania Herald also celebrate a ribbon-cutting ceremony, solving a local traffic congestion problem. As a kid, I mostly appreciated the huge earth-moving equipment involved in building freeways! I even had a set of plastic vehicles that included these monsters and other specialized highway building equipment, along with surveyors and other workers, signs, barricades, and more. Another common feature of small towns back in the 1960s was a small park. Often on a triangle or other odd-shaped piece of land near downtown, they would be a place to erect a monument, hold a ceremony, or just sit and rest. The park in Dundee was typical, with a bandstand dedicated to veterans of the Civil War and the Spanish American War, and complete with a Civil War Parrot gun made to fire 100 pound shells! Hey, is that our Impala parked next to the park? For a longer look at small towns in 1962, Gaye Gindy and Don Painter of the Sylvania Area Historical Society in Sylvania, Ohio have created a virtual museum exhibit page on their website. The entire page is dedicated to our special year, with photos, postcards, telephone book clippings, and newspaper clippings. It highlights news and businesses in that small town at the edge of the Toledo, Ohio metropolitan area. Included are some businesses from that era that are still in business. While we tourists might not need the services of a cemetery monument company or furniture store, you might want to check out the Seafood Restaurant, or maybe Sautters Food Center if your grocery supplies for the trip are running low. Well, I guess we have time for one more small town freeway story and then we'll have to go. Linda Gilson of the Milan Area Historical Society told me this one about the early days of the freeway at Milan, Michigan. The freeway north to Ann Arbor opened in November 30, 1962. She was a little girl at the time and says her mother had just learned to drive. Many women learned to drive late in life back then; my mother never did and my grandmother didn't until she was almost 60. Anyway, Linda's mother had to take her sister to Ann Arbor and decided the on ramp to the freeway must be the first ramp she encountered. Unfortunately, that was the off ramp. 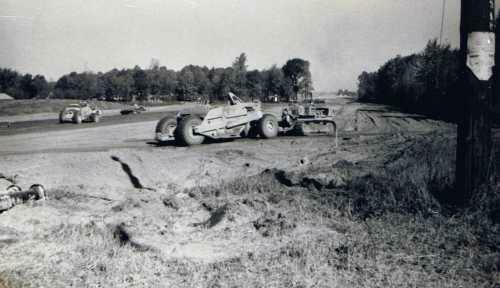 Linda's sister tried to warn her mother because she knew the correct ramp, having driven with her father several times. As she drove up the ramp, a car got off the freeway and forced Linda's mother out of the way. She backed down the ramp and learned to watch more carefully the next time she used a freeway. We seldom think about those days when freeways were new to people, and you had to learn how to use them correctly. They're automatic to us now. But compare them to today's newest highway design: the roundabout. What did you think the first time you came to one of those? I'll try to get it right when we continue our ROADTRIP-'62 ™ journey next week down US-23!